The pair put on fifty-plus stands in the three consecutive games including a huge 231-run stand in the 4th ODI. After two big losses in the first two ODIs, the Australian openers David Warner and Aaron Finch have handed the Aussies a great start in the next three ODIs. Finch, who returned in the playing XI after missing the first two ODIs with a calf injury, scored a century at Indore, a 90 in the game at Bangalore and was dismissed for 32 in the final ODI at Nagpur. Warner, who opened with Hilton Cartwright in the first two ODIs for fewer runs, returned to form in by scoring a century and a fifty in the last three matches. The pair put on fifty-plus stands in the three consecutive games including a huge 231-run stand in the 4th ODI which helped the Aussies open their account of wins in the series. With the help of the 60-run stand in the final ODI, the Warner-Finch duo completed 2000 runs as a pair in this format. 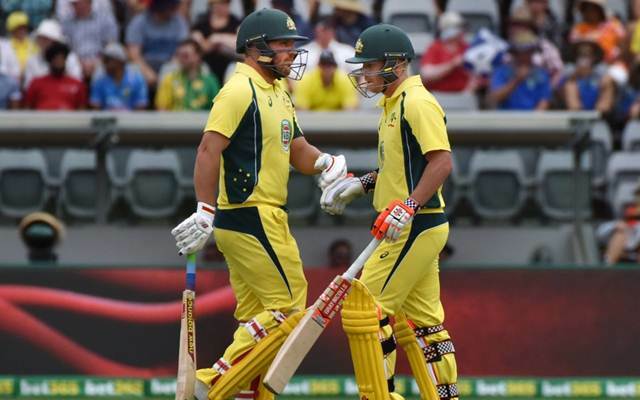 Thus they became the 16th Australian pair and the 87th overall to share 2000 runs in ODI cricket. Warner-Finch’s partnership average of 44.97 is the 4th lowest among the 16 Australian pairs with 2000 ODI runs. All the partnerships between Warner and Finch are while opening the innings together for Australia, making them the 4th Australian opening pair to account 2000 runs. Overall, they are the 17th opening pair in ODI cricket to aggregate 2000 runs together. 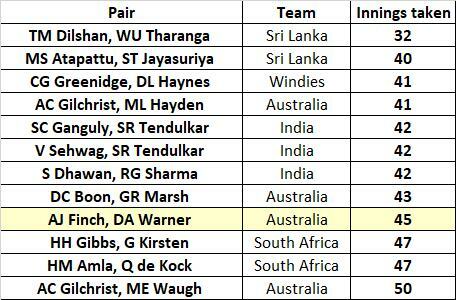 Among the 17 opening pairs with 2000 runs, Warner-Finch pair is the 9th quickest to complete 2000 partnership runs in the format as the Australians needed 45 innings. The Sri Lankan partners, Tillakaratne Dilshan and Upul Tharanga are quickest to complete 2000 partnership runs as an opening pair taking just 32 partnerships. The next fastest took eight more partnerships to complete 2000 runs.